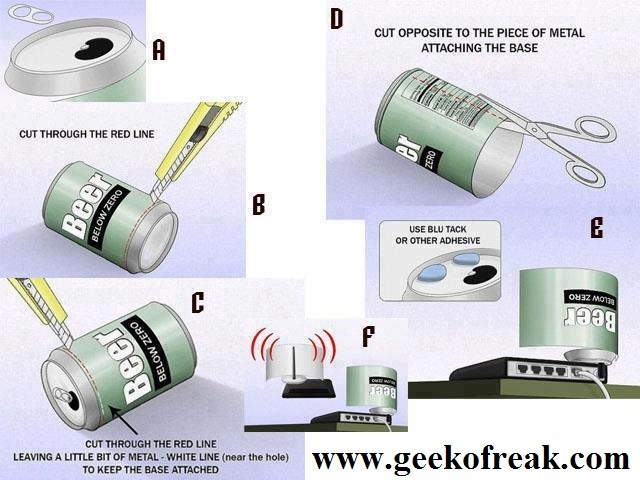 How to Boost your Modem Wifi Signals. Guys Today we will see How to Boost your Modem Wifi Signal Range. You may use an old Modem which has very weak Wifi Signals or maybe you are sitting far away from the router and signals may not reach you. In such situation what you do is replace the old modem with a new one. I recommend you to try this trick before you Buy a new expensive one, In this article we will use Beer or Coke Can To boost your router wifi signal range. Step 1: Take a beer or Coke CAN which you used in Past and clean it with water. Dry it and remove the Sticky Pull tab From the can. Check pic “A”. Step 3: While Doing the Step 2, you have to leave little bit of matel to make the upper side attached to the Can, Refer pic “C” . Dont cut the White line. Step 6: Thats all, This will boost your modem Wifi Signals. You can change the direction of Antenna where your Laptop is located To improve the signals and make it more effective. Thanks To Razortuts For this Usefull Post.